From left in foreground, Alex Jutras, Dorien D&apos;Entremont, and Barrett Terwilliger at Beverly’s McPherson Youth Center. When Ashley Fusolo’s school day is over, the Hudson sixth-grader can either stay home or head to the Argeo R. Cellucci Jr. Clubhouse where she meets up with friends, does homework, and plays board games. Fusulo said the decision is a no-brainer. Too young to work, and too old for structured games on the playground, middle-school students can be a tough group to keep happy and safe when the last bell rings. But there are options, and they don’t all cost an arm and a leg. The Boys and Girls Clubs of MetroWest, for example, has drop-in hours at its three clubhouses in Hudson, Marlborough, and Framingham Monday through Friday. Students in 7th through 12th grades can stay until 9 at night. The cost is $25 for the entire school year and includes transportation from schools to the club. Fran Hurley, president of the MetroWest organization, said activities are different at each club based on the interests of the students. 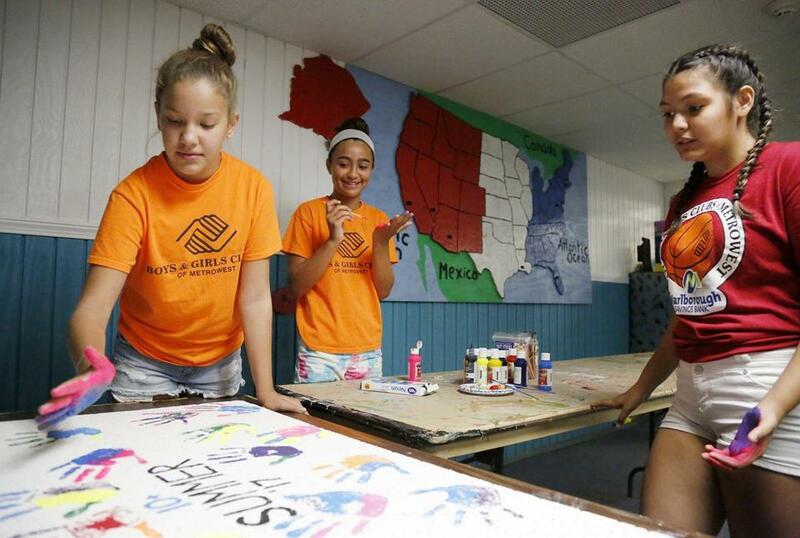 Gaby Tavares, 12, (left), Ashley Fasulo, 11, and Victoria Mier, 13, work on an art project at the Boys and Girls Club in Hudson. Organizers say the key to keeping this group of students off their phones and out of trouble is allowing them to have a say in what they do and for how long. 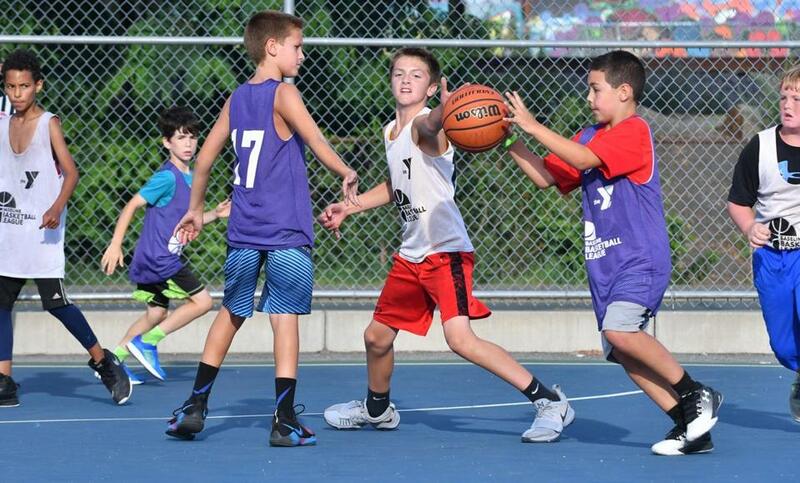 The North Shore Y operates programs in Beverly, Gloucester, Salem, Marblehead, Haverhill, Ipswich, and Plaistow, N.H. Activities might include a basketball league, pizza making, skateboarding competitions, magic, and squirt gun painting. Membership rates range from $15 to $26 per month for youths and teens. The Ys offer a variety of different programs to meet the needs of the different students — whether it’s a drop-in teen center, instructional classes, or team games, O’Neil said. “What we find is there are a variety of program models that are going to work for this age group,’’ O’Neil said. In Weymouth, the town’s Youth and Family Services department operates a Teen Center that is open during the week after school and during vacations. The center is open for students in sixth grade and older and is free of charge. The center has pool and ping pong, video games, an exercise room, tutoring, a TV, space to hang out and chat, and special events, said Kathy Collins, department and teen center director. She said businesses sometimes provide tickets to events like the Boston Celtics and Boston Red Sox. Collins said the kids all have different interests so it’s important to offer a variety of activities to keep them engaged. 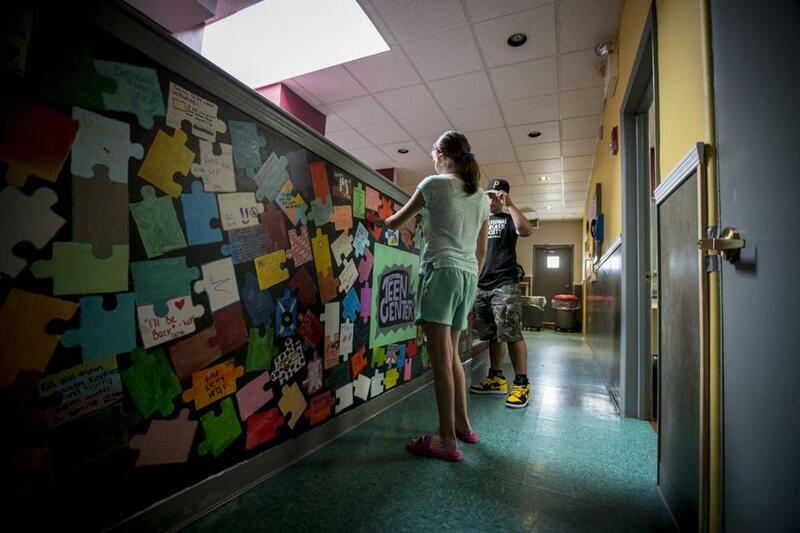 Melanie Nee, 13 and Marco Pizzi, 15, near a puzzle wall at the Weymouth Teen Center. Gaby Tavares, a seventh-grader who attends the Hudson Boys and Girls Club, said she likes being exposed to new activities. “They get us to try different things that are out of our comfort zone – things that we wouldn’t want to play,’’ she said. Hurley said students can take part in academic programs, leadership clubs, and recreational activities. “The key is you want to make sure they feel comfortable, safe and engaged with the group and that’s a continuous process,’’ he said. Hurley said one of the biggest issues facing middle school students is cyber-bullying so screen time is limited.